When Moran, Ruyu, and Boyang were young, they were involved in a mysterious “accident” in which a friend of theirs was poisoned. Now grown up and estranged, the three friends are separated by these events, and by time and distance. Moran and Ruyu live in the United States, Boyang in China, yet all three are haunted by what really happened that day, and by doubt about themselves. In California, Ruyu helps Celia care for her family and home, and avoids entanglements, as she has done all of her life. In Wisconsin, Moran visits her ex-husband, whose kindness once overcame her flight into solitude. 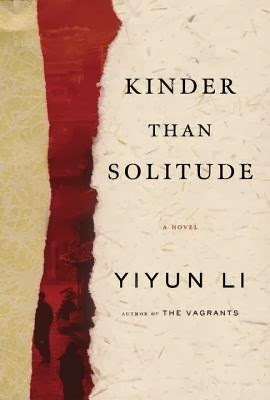 In Beijing, Boyang struggles to deal with an inability to love, and with the outcome of what happened among the three friends twenty years ago. This is probably 3.5 stars, but I couldn't quite bring myself to make it 4 stars. Kinder Than Solitude started strongly and I loved the poetic prose and descriptive language. But, for me, the story just got a little bogged down towards the middle and I found myself getting bored. The changing time periods and narratives were fine and not a problem to follow but I just never felt sucked in to the story or fully captured by the characters. This is a book I am very glad I read and it made some interesting points, but I didn't fall in love with it. Even so, I can recommend checking this out if you like a dose of the philosophical in your literary fiction.